The New York Shaolin Kung Fu community changed its face forever this July 8, when the fabled Shaolin Temple opened its first American branch in Flushing, Queens. 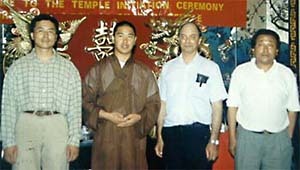 The Temple will be run by The Society of Shaolin Temple, under the leadership of Master Shi Guo Lin. On the same day, the newly formed Society created an alliance with the American Center for Chinese Studies, led by myself, Master Frank DeMaria. The Society's mission, and the purpose of the alliance, is to teach and develop the practice of Ch'an (Zen) meditation and the martial arts through classes, lectures and seminars, all open to the public. The creation of the Society and the union between the two schools are the first steps in a massive campaign to bring authentic Shaolin skills and philosophies to the American public. Master Shi Guo Lin and I believe that these skills and philosophies have been hidden behind the Temple's walls long enough, and the Shaolin Temple has sanctioned our efforts to release them to the world. To begin our endeavor we have arranged a series of informative interviews designed to shed light on the true teachings of Shaolin, and to promote the methods and goals of The Shaolin Temple Society. Also, since the inception of our web site numerous e-mails have been received questioning various aspects of Shao-lin training. These too are answered. The amount of material is very large and will be presented here in a series. We have selected the most important and meaningful questions received over the years. Because of the large amount of material presented here we did not attempt to separate the questions into specific categories, but broke them down into sections entitled: Styles and Techniques, Wu De Ethics and Spirituality. Master Shi Guo Lin, the Society's Director, entered the Shaolin Temple in Henan, China at the age of 15. 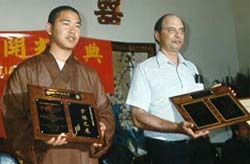 He has attained the ranks of Master Shaolin Fighting Monk and National-Grade Master of Qigong. Master Shi Guo Lin's instructor is Shi Yong Xin, the present successor to the Abbotship of the Shaolin Temple. My instructor was the renowned Shuai Chiao Grandmaster, Chang Tung Sheng. This is the transcript of our first interview. Master De Maria's questions are indicated by "DM," and Master Guo Lin's responses are indicated by "GL." DM: First, please allow me to formally welcome you to the United States. It is truly a pleasure to have you here in New York. When you came to the United States, you visited a number of martial arts schools. Why did you pick The American Center for Chinese Studies as a Brother School, and what are your goals for this alliance? GL: I have visited many organizations since coming here to the US, and the American Center for Chinese Studies has made the greatest impression. The ACCS teaches both Buddha Dharma and the Martial Arts, and we share the desire to spread Ch'an and the martial arts tradition. I believe it is Karma that Master DeMaria and I met, because our beliefs and purposes are so similar. Together, we can spread the ancient traditions of the Shaolin Monastery, cultivate the mind through Ch'an Meditation and strengthen the body through Chinese martial arts. 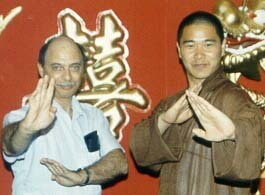 We are both strong advocates of the harmonization and unification of Ch'an and Shaolin Martial Arts. DM: You are the first one ever to have obtained recognition from the Head Abbot of The Shaolin Temple for the sole purpose of setting up a branch of The Shaolin Temple in the United States for spreading the true Shaolin Kung Fu to the American people. Is the new Shaolin Temple Society the only official representative of the authentic Shaolin Temple in Mainland China? GL: A lot of people outside of the Shaolin Monastery try to use the name "Shaolin," which may either harm or benefit the name of the Shaolin Temple. However, many of these people do not understand the true meaning of the term "Shaolin Martial Arts." 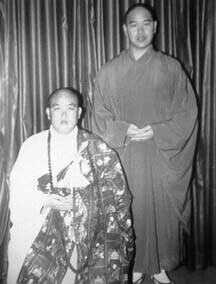 I was given full responsibility by the newly-appointed Abbot of The Shaolin Temple and by the Honan Province Buddhist Association to represent the Shaolin Monastery here in the US, and to teach the true meaning of the practice of martial arts. My purpose is to spread the true meaning of the practice of Shaolin Kung Fu. The Society of Shaolin Temple in Flushing, New York is, therefore, the first organization outside of Mainland China to be the official representative of The Shaolin Monastery in spreading the true Shaolin traditions. DM: The American people have heard a great deal about the legendary Shaolin Temple, and you went there to become a monk at a very early age. Could you please tell us why you decided to become a monk, and why you chose to go to the Shaolin Temple? GL: I come from a Buddhist family, and my village is near the Henan Shaolin Temple. This is why I chose the Shaolin Temple. Also, I began studying the martial arts under my father when I was very young. It was then that I developed my love for the martial arts. Having a great interest in Buddhism and martial arts, I decided to study them both at the Shaolin Temple. This met my spiritual needs and fulfilled my desire to train in the martial arts. DM: I understand that you come from a Buddhist family and were raised with all the Buddhist traditions, such as never eating meat and following the precepts of the Buddha. Yet, you were still very young when you decided to join the Shaolin Temple. What did your family think about your leaving home at such a young age to become a monk? GL: Even though I was raised in a Buddhist family, I was a natural vegetarian. Lay Buddhists are not required to abstain from meat, but even as a child, I would get nauseous at the sight of meat. I never liked it. And when I left home to become a monk at the Shaolin Temple, I had the full support of my parents. Because I was a natural vegetarian, my parents thought I had a very strong Karmic affinity with Buddhism, so they had no problem with me becoming a monk. My grandfather also agreed with my becoming a monk and it was he who sent me to the Temple. DM: We know that the Shaolin Temple is about 1500 years old. Could you give us the exact year it was built and by who's order? GL: The Shaolin Temple was built in the year 495 A. D. by order of the Emperor of the Northern Wai dynasty, for a high ranking monk from India named Ba-Tuo. DM: Do many of the Chinese people today in mainland still want to become monks, and is Buddhism still a driving force in China? GL: Even today many people still want to go to The Shaolin Temple to become monks. But many of them want to become monks for the sole purpose of learning Shaolin martial arts, and not for studying Buddhism. Actually, it is very difficult to become a monk at the Shaolin Temple. Fortunately, I now see a revival in Buddhism in China. DM: What makes it so difficult to get into The Shaolin Temple? GL: We at The Shaolin Temple know that many young people go there for the sole purpose of learning the Shaolin arts. The Shaolin Temple is primarily a place for Buddhist learning, so we are very careful about the motives of the people who come to the Temple. The Temple's primary concern is teaching of the Buddhist doctrines. Many fail to understand this simple truth. DM: Why is Shaolin Kung Fu so unique to the Shaolin Monastery? Why do other Buddhist Monasteries throughout China not teach the martial arts? GL: Historically, The Shaolin Temple has taught martial arts as a vehicle to further the spiritual cultivation of its monks. Other Temples did not use this method of aiding their Buddhist cultivation. DM: Is it true that not all of the monks at the Shaolin Monastery practice the Shaolin arts? Is it a choice that each monk makes when he enters The Shaolin Temple? GL: The majority of the monks at the Shaolin Temple do study the martial arts to aid their cultivation of Ch'an. However, there is a minority of monks who do not practice the martial arts. Instead, they may practice Chi Kung to enhance their health. But generally speaking, most who come to Shaolin take advantage of the help the martial arts gives in spiritual cultivation. DM: How does the practice of martial arts help in spiritual cultivation? GL: The study of martial arts requires great concentration. When a person focuses his mind on practicing his martial arts, he clears his mind of all distracting thoughts. This is analogous to Ch'an meditation, where a person tries to settle his mind of all distracting thoughts. This also involves the question of "body and will." Even when a martial artist practices his form with his body in motion, he is still cultivating his mind. It is the same with meditation. When a person sits in meditation, he is cultivating his mind even though he is motionless. In the martial arts, a person is in motion, yet is still cultivating his mind. The Buddha said that there are "84 thousand Dharma doors," meaning that there are many ways for a person to cultivate his mind towards enlightenment. From this it follows there are many expedient paths that one can follow in self cultivation. That is why the Shaolin Temple chose martial arts to be a vehicle for meditation. The practice of meditation and the martial arts are only phases a cultivator goes through in his search for enlightenment. Whether we use meditation or martial arts, we are still cultivating our minds. DM: How would you respond to the media-driven impression of most Americans that Shaolin is mainly a fighting art, something used only to enhance one's self defense abilities? GL: When we see Shaolin Kung Fu in the movies and on television, we must remember that this is only theatrical showmanship. Because it is entertainment they are trying only to bring out the excitement of the arts. However, a true practitioner of Shaolin does not focus on violence. A true Shaolin monk uses the martial arts for his search for true spiritual cultivation, and to help others in their personal search for inner peace and enlightenment. DM: Does this mean that a Shaolin Monk would not use his martial arts for self defense and, if he did, to what extent would he use his fighting skills? GL: Of course a Shaolin Monk would use his Shaolin Kung Fu to defend himself or his monastery. However, a Buddhist monk has to follow the principle of showing compassion to all living beings. He would not go as far as killing or maiming anybody. He would try to inflict the least damage possible to any person who causes trouble. DM: In the past, it has been said that there are some Shaolin monks who have taken lives in the heat of battle. Would you say what we have read and heard is false? GL: The Shaolin Temple has a long history, so it is likely that in the past a Shaolin Monk has indeed taken a human life. However, this was done during periods in history where it could not have been avoided. There were times of war when outsiders were trying to plunder the Shaolin Temple. But a true Buddhist monk does all he can to avoid taking a life. A Shaolin Monk who needlessly kills cannot represent Buddhism in general. In addition, a monk might take a life, but in the spirit of a Bodhisattva, that is, he does so to save the lives of others, takes responsibility for what he has done, and willingly accepts the karmic consequences of his actions. DM: I have heard there is more than one Shaolin Temple. One in the North of China and one in the South of China. In fact, some say there is even a third Shaolin Temple. What can you tell us about this? GL: Yes, this is true. The Temple in the South of China is located in Fujian Province . I have heard that there have been as many as ten Shaolin Temples in the past, but these were all branches. DM: What is the difference between the Southern Kung Fu and the Northern Kung Fu? GL: Although the Southern Shaolin Temple does practice what you would call "southern style," and the Northern Shaolin Temple practices what you would call the "northern style," the underlying Kung Fu principles are the same. DM: We understand that the underlying principles such as inner power, balance, coordination and proper flow are the same between all arts, but how would you explain the outward differences in appearance between Northern and Southern techniques? GL: There is a difference in the use of technique. You have heard the phrase, "Southern fist and Northern legs," indicating that the two Monasteries take different approaches. However, the difference is mainly a matter of emphasis. DM: Many American martial artists say that the Northern techniques are better than the Southern techniques, and others claim the opposite. How would you respond to those preferences? GL: I believe the Southern styles have a greater emphasis on the fist, and Northern styles favor the legs. But from my experience at the Shaolin Temple, I really believe that there is no difference in quality of techniques. Both in fact are equal, each as good as the other. It is mainly a matter of taste which makes people choose between them. DM: Many would argue with you that the forms differ greatly between the Southern and Northern schools. How would you explain the differences in form? GL: I agree that forms do change from school to school. However, I think that this does not change the underlying principles, which make all of Shaolin excellent. This underlying principle is Ch'an cultivation, which is inherent in both schools. Ch'an will always remain Ch'an, no matter which school it comes from. DM: Your answer makes it clear that both Northern and Southern schools share the same excellence of technique. But you also mention there is in fact a difference in the various forms of each style. Where did these differences come from? GL: I think that the differences come from the differences in history. There are many factors which contribute to the change in styles, such as weather, terrain, habit, and customs. So many people have contributed to Kung Fu's growth throughout the centuries that it is no wonder there are so many variations in form and structure. But form and structure are not what make Shaolin great. The mind makes what we do great. This mind I talk about is common in all Shaolin, both North and South. DM: I have heard that there may be as many as 360 styles of Shaolin Kung Fu. How many would you say have been recorded and taught at The Shaolin Temple? GL: At present, approximately 200 forms are practiced at The Shaolin Temple. There may very well be more than 360 different styles, but we have focussed on about 200 of them. DM: Do you think it is possible for any one monk to learn more than one hundred different forms and retain then all? GL: Because we train intensively each day, it is possible to learn and retain over 100 different forms from various styles. This is made possible because of the total dedication to practice and mind cultivation. GM:> Of all the many martial arts in the world today, is it Master Shi Guo Lin's feeling that the Chinese Shaolin arts are the most sophisticated and most effective? GL: I personally believe that the Shaolin arts are among the best in the world. This is so because the very essence of the martial arts is concentrated in Chinese Kung Fu. DM: We have been told that Chinese martial arts are in fact the forerunners of all martial arts, and that Karate, Judo, Taikwondo and the others are all but extensions of the Chinese arts. Is this true? GL: It may very well be Shaolin martial arts have a 1500 year history. During this time, the Shaolin arts have been transmitted to every corner of the globe. Therefore, I feel it is safe to say that Shaolin is in fact the mother of many styles of martial arts. DM: You agreed that Shaolin is a very effective and sophisticated art form. Taking that a step further, do you think it is the art form that makes a person great, or the person that makes the art form great? GL: I think it is both the art form as well as the person that makes the martial artist great, but what a person learns is also of utmost importance. One man can not possibly learn all the styles of Shaolin, but the Shaolin arts have had the time to undergo improvement after improvement, making each form very powerful and effective in and of itself. If a man is naturally good and he has a poor style, the man cannot excel. However, if a man is not good, with a good style he can learn to be good. Of course, natural talent always plays a role in everything we do, but the style also counts a great deal. DM: Who is the head of the Northern Shaolin Monastery and how is he appointed? GL: Right now, The Shaolin Temple does not have an official Abbot. The last Abbot passed away in 1987. My master, Rev. Shi Yang Xin is the acting Abbot and successor to the past Abbot. Although he has been appointed the next Abbot, and has taken on all the duties of the Head Abbot of The Shaolin Temple, he has not yet been sworn in. DM: Who decides who will be the Head Abbot of The Shaolin Temple? GL: In the past the Head Abbot was appointed by the Emperor after being chosen by the present Head Abbot to be his successor. However, in the absence of an Emperor, the Chinese Government has the responsibility. My teacher, Shi Yang Xin was chosen by the last Head Abbot as successor. The Chinese government recognizes this, and we expect he will soon be officially sworn in as the new Head Abbot. DM: What are the Head Abbot's main responsibilities, and does he also practice the Shaolin arts? GL: The Abbot oversees all the activities at the Shaolin Temple. and Yes, he also practices the Shaolin arts, and happens to be an excellent martial artist. DM: You acquired the title of Head Coach at the Shaolin Temple. How did you get this title and who appointed you to this position? GL: Two reasons. First, the young monks at The Shaolin Temple are my martial arts brothers and I had their trust and respect. Of course, there are other monks at The Shaolin Temple whose kung fu skills are even better than mine, so that was not the only reason. I am also the senior disciple of my teacher. For these reasons, I was selected to be Head Coach. DM: What are your responsibilities as Head Coach? GL: The main responsibilities are to oversee the daily meditation and Kung Fu practice. DM: The robes that Shaolin Monks wear are all of different colors. Does this indicate rank in the Shaolin Temple? GL: The robes I believe that you are referring to are called the "jia-sha" an outer toger worn over an inner rob. The color of the jia- sha does signify rank. Generally, monks who wear a red jia-sha are ranking. There are also different types of jia-sha that are made up of various numbers of strips of cloth. For example, the Abbot can wear a jia-sha made of twenty-five strips of cloth. There are also jia-shas of nine strips, seven strips and five strips. All monks are supposed to have a set of these three types (9, 7, 5 strips) of jia sha to be worn for different occasions. DM: Americans tend to associate rank with color belts worn in Karate-type systems. If Shaolin monks do not use color belts, how does Master Shi Guo Lin indicate rank with his students? GL: The Shaolin Temple does not have a formal ranking system such as the belt system. A person who has achieved a high level knows he has done so, and does not need a belt to show others. A person's rank is not shown on the outside, but rather is shown in his heart and physical ability. DM: In American martial arts schools, a student is taught both classical form as well as self defense techniques. Is this the same practice in Shaolin Temple? GL: Yes. At the Shaolin Temple, the monks are taught much the same way with forms, self defense, Chin Na and so forth. However, I feel that here in American these techniques are not complete. The cultivation of the mind is missing. This is the complete way. Techniques and forms are only part of the total scope of Shaolin. At Shaolin, we also have meditation, which clears the mind. A clear mind can see and react much quicker than a clouded mind. This is what enhances techniques and form. DM: You know that in America street violence is somewhat different than in China. Here, an attacker may be armed with a gun. How does Shaolin handle American-style violence? GL: If a person confronts me with a gun, the circumstances will determine the outcome. If there is a great distance between us, there is little I can do, for one pull on the trigger will take my life. However, if the distance is short between me and the gun, there are methods for me to use to disarm the assailant. DM: There are numerous types of martial arts weapons by both the internal and external styles. Which types of weapons are taught in the Shaolin Temple, and why are these chosen over the many types that are available? GL: I feel there is no difference between internal weapons and external weapons. In fact, there is little difference between weapons at all. If a person picks up a weapon and it is not coordinated with his chi, the weapon is useless. Which weapon you choose to learn is not as important as the inner chi that controls the weapon. However, to answer your question, the main weapons are the staff, spear, Jen and Dau. Although we do use other weapons, these are the most common. DM: Tournaments are very popular in America. Is there tournament competition among the monks? If not, why? GL: No, we do not have formal competition at The Shaolin Temple. We do have personal sparring between monks to test our skill levels, but the purpose of martial arts is not to see who is better or who is worse. The true purpose of martial arts is to improve our character and to help us reach enlightenment. DM: Master Shi Guo Lin has been in American a few years now. What is your general opinion of the state of martial arts in America? GL: I have met many martial artists here in America, and I feel that many of them overemphasize the physical aspect and neglect the spiritual training. The practice of pure violence can never bring inner peace. However, if the physical skills are tamed by a clear and calm mind, the benefits can be greater than you can imagine. DM: American martial artists are always searching for the so-called "original styles" of Kung Fu. Each school claims they have the "original style," unchanged since its inception in Shaolin. How would you respond to those who seem to think the original of anything is always the best? GL: No matter what form one practices, the one thing I see that is lost is the original meaning behind learning forms. Also, "original" does not necessarily mean "best," for Shaolin is always improving with time. Originality is not the question. The real value in any style is the way the internal meaning is understood. DM: Shaolin is most known for its "external" art forms, but we also know that the so-called "internal" arts were in fact derived from external Shaolin Kung Fu. Does the present day Shaolin Temple practice any internal arts such as Tai Chi, Pa Kua or Hsing-I? GL: Many people see the so called "hard styles" and equate them with "external" martial arts, and "soft styles" with "internal" martial arts. In reality, there are no differences between internal and external martial arts. External martial arts include the internal factors, and the internal martial arts include the external factors. This is Yin and Yang. You can not have Yin without Yang nor Yang without Yin. In The Shaolin Temple, there is a Kung Fu called Jin Gang Chuan which means "Adamantine fist." This style is very close to what people understand as the "internal" martial arts. The term "Jin Gang" is a translation of the Indian Sanskrit "Vagra" which refers to an invincible substance, hard like a diamond, likened to the Buddhist Doctrine.